Nokia has updated their HERE Drive+ and HERE Maps apps for Windows Phone today to allow users to create a new Here.com account for map and favorite synchronization. The update for both apps is available now in the Windows Phone store. With this update, users will be able to create a HERE account on here.com where you can import your favorites from your old Nokia account so they are synced with your device and the site. This is part of the continued separation of what remains of Nokia and the mobile division which is now owned by Microsoft. Functionally both apps remain untouched, with HERE Drive+ providing turn-by-turn instructions for Windows Phone users while HERE Maps provides offline maps to over 135 countries, allowing you to find your way even without a data connection. 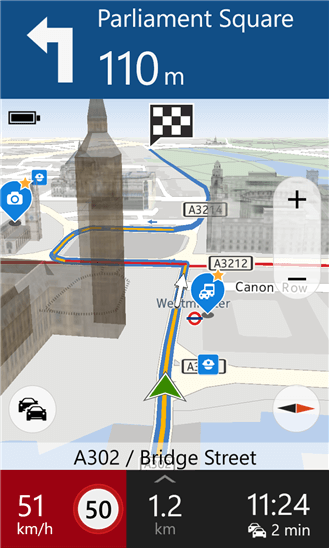 HERE Maps also brings augmented reality to your Windows Phone. If you hold your phone up with the app running you will see floating labels for nearby places on your display.